Underpinning is a type of remedial work employed to strengthen and stabilise the foundation of an existing building that transfers the load of a building onto more stable ground. 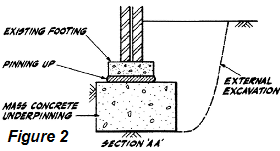 Underpinning foundation solutions are generally sought where the use or safety of a building is or is likely to be compromised by excessive ground movement (Subsidence), usually as a result of changes to the supporting soil. The type of underpinning required will depend on the type of soil present and the existing foundations, and should only be specified by suitably qualified engineer. PKT Consulting Engineers can provide a specific underpinning design solution to prevent ongoing movement in a structure. 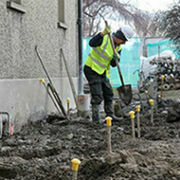 Call 01 491 2415 today or email info@pkt.ie if you are concerned about foundational problems of your home or property and need advice about suitable underpinning solution. We will provide you a quotation. 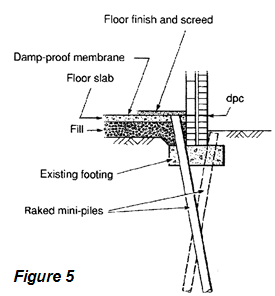 This involves excavating adjoining bays beneath the existing foundation in a sequence, filling the excavations with concrete and then filling the small gap between the old and new foundation with non shrinkable material (See Figure 2). The sequence is indicated by the numbers in Figure 1 below. 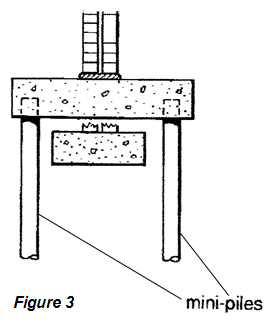 Vertical piles are installed either side of the wall, their heads are connected by casting a concrete needle beam that passes through the wall (see Figure 3). 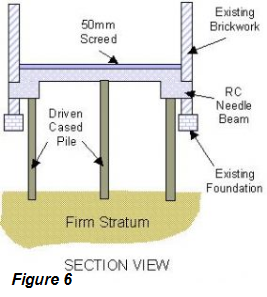 An alternative variation of this type is a cantilever beam is used instead of the needle beam, this eliminates the need for piling inside the building (see Figure 4). Or inclined mini-piles, installed through holes drilled in existing foundations. (see Figure 5). 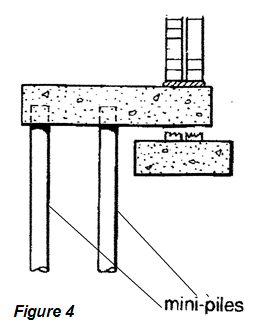 Mini-piles are installed within the property and a reinforced concrete raft is cast integral with the piles. 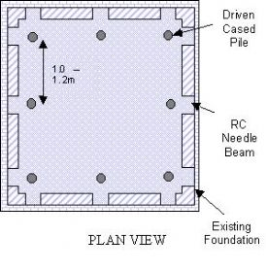 Needle beams extend out from the slab into the walls below ground level to support them (See figure 6).